Parish Share – how should we calculate it? I am a member if Diocesan Synod (part of the governance of the Diocese) and today we are debating a motion that was brought by one of the members about Parish Share (how much each Parish should pay into the Diocesan pot). Parish Share pays the clergy and the staff and training, plus some goes towards running the schools and the cathedral (I think!). Different Dioceses have different methods for calculating the Parish Share and indeed some Dioceses pay less out of Parish Share – they pay less or nothing towards the schools and have fewer Diocesan staff. But today we are debating a motion that says if you are growing and your number of people on the electoral role goes up then it is a good thing and you shouldn’t be penalised by paying more Parish Share. On the one hand I don’t like this motion because it makes Parish Share sound like a tax rather than a joy to pay into the common purse. But I do understand that the last part of a person to be converted is their wallet and so there is a lag between new people arriving and new people giving. In this Diocese the Parish Share is calculated as £45k per Stipendiary Priest you have and then an additional amount for the central costs based upon electoral role and other considerations. In this Parish the extra bit is about £15k so in the scheme of things I don’t think the motion will make much difference. The Parish Share is meant to be capped at 65% of the total income of a Parish. However, it must go up by 1% per year. In this Parish our share is 91% of our income – so it is no wonder that we can’t pay it! I do have a problem with the idea in this Diocese that you can have as many stipendiary clergy as you can pay for. This means that rich Parishes can pay for several stipendiary clergy and poor Parishes can’t really pay for even one. This feels like capitalism rather than Christianity. It doesn’t feel like all disciples holding everything in common. Sorry to talk about funerals again – I do a lot of thinking about funerals, I find it a really rich and wonderful area of ministry. People often say to me that they would hate to do my job because of the funerals aspect, normally the bereaved, but funnily enough I find bereaved people minister to me and teach me so much about God and life. I think they would be surprised by this. I was really affected by the lost yachtsman who came from Farnham, his death came right after another young person who suddenly lost his life and it felt like the whole town was grieving. It struck me that there wouldn’t be a funeral without a body, and of course there would be no opportunity for the family to see their deceased relative. For me, I think the reality of the dead body of my loved one helps with my grief. I used to regularly have dreams that mum was alive and when I woke in the night, confused and distressed, I would remember the day when I drove to the hospital to see my dead mother, and that helped me resolve my confusion so many times. Then I read this lovely piece by Nancy – On not having a Funeral. Her mum donated her body to medical research and she thought it would be a good thing not to have the coffin there at the service, but it left Nancy struggling to gain closure. I’m sure I would feel the same way. For me, the healing aspect of a funeral is twofold. The first is the impact of sitting in front of the coffin for half an hour and recognising that the person is dead, my gaze keeps getting drawn back to the coffin and I find myself thinking, “Oh my God, they are dead and I’m not going to see them ever again in this life.” The second is recognising that the person in the coffin was human – they were good and bad, loving and fearful, perhaps a drunk, perhaps compassionate, perhaps anti-social, perhaps inspiring, perhaps lonely, perhaps faithful, perhaps adaptable. Whoever they were, the sum of their life describes something authentic about the human condition and God loves them and loves us just as we are, warts and all. I know this completely and absolutely during a funeral service and it makes me weep with gratitude, God is such an amazing lover of us all. So what is the point of a funeral for you? I write this at a time of celebration as it is 20 years since the first women were ordained priest. Yes, I do celebrate with great thankfulness the gifts women have brought to the church as priests, yet I myself was caught out by the re-emerging pain of those times. Please pray for all those women who, like me, were unable to be priested in ’94 with the others and this time of ‘celebration’ is bringing back the pain with the joy. There were two of us in the Diocese of Guildford, my colleague was an LOM working with a vicar who would not allow her to be priested… and myself. At that time we had to jump through many ‘hoops’ to be sure that our vocation was to the priesthood and not simply the diaconate, though no one could ever explain to me what the difference was, and that we would be up to the task of ‘being the first women’. All this caused me so much stress that my recovery from depression was reversed and I became too ill to go through with it. To my great distress I had to pull out. The Lord was good to me even then!! I was on pilgrimage to the Holy Land and in Jerusalem when the ordinations were taking place. A time of great consolation. My first celebration of the Eucharist was at a quiet midweek service in the church at Sands. I was privileged to serve in the Parish of Seale, Puttenham and Wanborough, who gave me back my life and my confidence. In 2001 I ‘retired’ to my home parish of Hale with Badshot Lea. I felt that the Lord had called me back here to serve, and very soon we were all faced with quite a series of trials and tribulations…. Now, 13 years later, I am thankful for the privilege I have had of serving here as priest, and I thank you all for the love and kindness you have given me. However, as many of you know, the breakdown of my health in the early years of my ministry, faced as I was with the stress of being a ‘woman’ when the church was undecided what to do with us, has left its’ marks in me. I am tired now and I have decided to ‘come of the rota’. I will, of course, remain here as a worshipper in the congregation and hope to enjoy the journey with you all for many years to come. May God continue to bless us into the future. The memories that I retain of my father now he has died are not necessarily the ones I would choose. Many of the strongest memories are the ones where I saw him suffer the humiliations and agonies of aging whilst I looked on with horror and helplessness. One such memory was visiting my parent’s house when dad was actually still relatively well physically, although psychologically he was suffering. I asked my mum where dad was and she dismissively said he was messing around with his hearing aid, and had been upstairs for hours. My dad was completely deafened in one ear during the war and had very poor hearing in the other ear – he didn’t lip read or sign and so his hearing aid was the only thing that prevented him being completely isolated. I went upstairs with my heart in my mouth and found my dad in a dreadful state. Littered all over the bed were tens of hearing aid batteries and my dad looked at me with a look of unadulterated desperation. He looked like a child, somehow. I took his hearing aid and it was obvious what was wrong with it. It took me a second to fix it and I returned it to him. He took it with that look when people are afraid to hope and then when he found it worked he thanked me profusely, as if I had just saved his life. It was all I could do not to cry. Apparently, 40% of hearing aids remain in people’s drawers because they stop working and need fixing. They need simple things doing to them like having the batteries changed or the tubes drained. If you would like to help people with their hearing aids then we are starting a project called “Here Hear” – read more about what the Diocese of Guildford is up to here – http://www.cofeguildford.org.uk/diocesan-life/deaf-inclusion/ and let me know if it is something you’d like to be involved in. I obviously care deeply about this project! Are we losing the ability to mourn? I attend a lot of funerals and I am very thankful that I do because I gain so much from funeral ministry. I do most of my learning about life by listening to the relatives of the dead. I am so incredibly thankful to all those who have shared with me their stories. However, I’m not sure society helps those who are grieving. I worry sometimes, when people die, that we think we can avoid mourning. We try to bypass it, to re-frame it. Of course this may be our coping mechanism and coping mechanisms are sometimes vital. Where does mourning fit into this? Moreover, we have replaced the word dead with “passed away”, “passed over”, or “gone”, as if in avoiding saying the word we can deny its existence. I use the words “dead”, “death” and “grief” a lot, but I rather suspect I’m breaking a taboo. In Victorian times there were strict rules on mourning – for example a widow or widower should mourn for four years and this would be evident by the clothes they wore – obviously, not all of these rules would be appropriate today – but what they did do was to make time for the process of grief to be worked through, and they alerted others to the fact that a person was grieving. Jesus said that he came that we might have life in all its fullness. I believe we do this best when we support each other and to stand alongside others who are grieving, without colluding with denial, painful as that process it. I loved our Parish Weekend Away – found it so restoring for mind, body and soul, and it was so good to be with the church family – and we were family that weekend, we are family. The weekend began on the afternoon of Friday 16th May, with tea and chocolate cake, before being shown to our comfortable rooms. This began two days of workshops, worship and relaxation -not forgetting mealtimes when home cooked food was plentiful and delicious! The programme included art and religion, meditation, drama, Taize, praying using the internet and a visit from the Dean of Guildford Cathedral. Saturday evening, as is usual at Wychcroft, was spent entertaining each other with skits, poems and much laughter. A highlight for me was a Kenyan communion service in the beautiful chapel after Sunday lunch, before we left for home. Good company, beautiful countryside, great food (and no washing up! ), peace and relaxation make for a very enjoyable time. I would like to take this opportunity to thank Jennifer Paterson for her hard work in organising us all. I am tempted to organise one for next year – any takers? 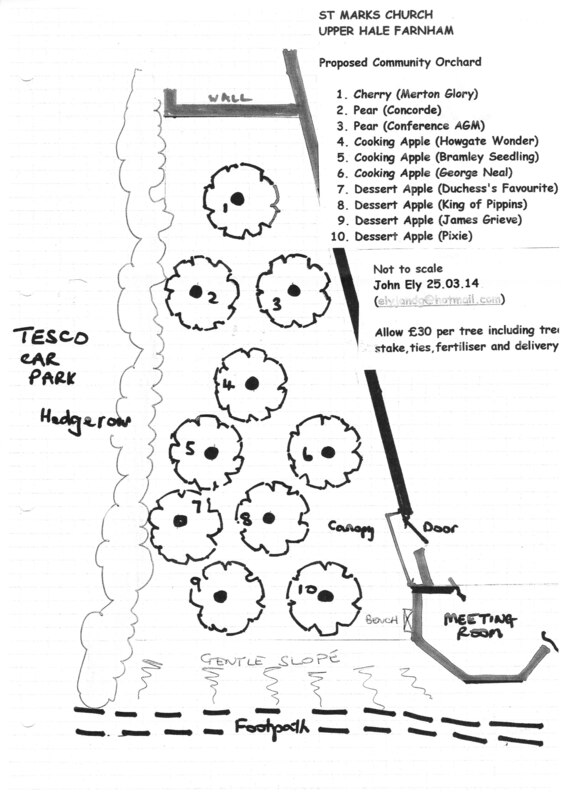 A Community Orchard in the Parish? We are hoping that this will be a community initiative, involving the local schools, uniformed organisations and youth as well as those of us who are longer in the tooth. After a few years, when the trees have started fruiting, we could host Apple Days at St Mark’s, bring a juicer to the church and all of us could bring out own apples to create juice, as well as pick the ones in the church. Apple Days can become good community events with Morris Dancers, cheese tasting, cider tasting and worship too. We are very thankful to John for giving us his expertise and offering to help. I very much hope that we obtain permission to use the church land in this way and that we plant the trees this autumn. If anyone is interested in helping with this project then please contact Lesley. Everyone finds youth work challenging. Kids don’t want leaders who are cool – they get enough of that at school. People of any and every age can be youth leaders – it isn’t just for the young and often older people are better. What kids want more than anything is to be loved and included in the fellowship of the church. We are phenomenally lucky in this Parish to have so many youth interested in the church. Non-paid volunteer helpers with the youth are much more effective than a paid youth worker. There was a statistic from some research into church youth work that blew me away: If the youth group has only two people from the church helping who “have to” eg (the youth worker and the vicar) then a youth group of 10 will keep one young person in church into their 20s and beyond. If the youth group has four or five non-parental adults helping then a youth group of 10 will keep 8 young people in church into their 20s and beyond. Youth know if people “have to” be there, but when older people from the congregation choose to be there then they know it is that the older people genuinely care about them and are a genuine spiritual family for them. Thinking back, I became a Christian through the Youth ministry of a church, but in particular through the love and care of a couple in their thirties who had three small children. They loved me sacrificially through the most difficult years of my life, and helped me go from a very dark place to a place where I was journeying towards the Light. It isn’t an exaggeration to say that I owe my life to that couple. I was also included into the church which was a bog-standard Anglican church and I was a foul-mouthed and very broken teenager, it didn’t seem like a natural marriage but it worked and I was loved back to a degree of wholeness. I was probably an extreme case, but being a teenager is tricky for almost everyone! If you are a regular worshipping member of the congregation and have a heart for young people then perhaps youth ministry is for you. Even serving a glass of squash and a biscuit is of great value, or sitting alongside a young person and asking about their week. In years to come you might find that your word of kindness to a young person may be more valuable than you ever imagined.